Summary: Government regulations for genetically modified foods vary, from relatively relaxed policies in the U.S. that focus on the final food product to strict rules in the European Union that consider the genetic engineering process used to make the food. Despite these differences, the common goal of these regulations is to ensure the safety of the food supply. To this end, regulatory bodies use scientific data to determine the potential impacts of genetically modified foods on human and environmental health. The data serve as a standardized basis to evaluate safety, such that discussions can move on to consider other economic and ethical aspects of regulations. “This is no fairy story and no joke; the meat would be shoveled into carts, and the man who did the shoveling would not trouble to lift out a rat even when he saw one—there were things that went into the sausage in comparison with which a poisoned rat was a tidbit .” In his 1906 book The Jungle, Upton Sinclair wrote an incendiary account of the conditions in Chicago slaughterhouses. The resulting public outrage contributed to the passage of legislation that allowed the federal government to regulate the American food supply . During the decades following World War II, several European countries worked together to regulate their food supplies. However, it was not until after several food crises in the 1990s—including an outbreak of mad cow disease in British cattle—that a central organization for food safety was established in the European Union (EU) . While government regulations for food safety were developed in part due to concerns over contaminated food, they also cover new technologies such as genetically modified (GM) foods. Government regulation of GM foods is not as straightforward as protecting the food supply from contaminated meat. Numerous parties have a stake in influencing the regulatory policies of GM food technologies, from consumers and non-governmental organizations to farmers associations and biotechnology companies. Within the dialogue of competing interests, scientific studies contribute to the regulatory process by assessing the potential impacts of the foods on human and environmental health. While the U.S. and the EU take opposing approaches in regulating GM foods, they use similar types of scientific data to reach decisions about approving products. One representative example of a GM food that successfully went through both regulatory processes is Syngenta’s Bt11 strain of corn (see this article). In the U.S., the same regulations apply to GM and conventional foods because despite the different processes used to make them, the final products are considered to be similar. The overarching policy for the federal government regulation of GM foods was set in 1986 during the Reagan administration, in a document by the White House Office of Science and Technology Policy called the Coordinated Framework for Regulation of Biotechnology. The document concluded that foods made with genetic engineering techniques are not fundamentally different from conventional foods in terms of overall composition, so there was no need for legislation specifically dealing with GM foods. In other words, agencies should use the same regulatory processes to evaluate conventional and GM foods. Ultimately, the document established that regulation should focus on the nature of the final food product rather than the process by which the food product is made . Three federal agencies enact regulations that can apply to certain subsets of foods, both conventional and GM. The Food and Drug Administration (FDA) evaluates the safety of substances added to foods, such as color dyes, artificial sweeteners, and genetically engineered proteins. The U.S. Department of Agriculture (USDA) prevents the spread of potentially invasive new plants within the U.S., including plants imported from other countries and GM crops. The Environmental Protection Agency (EPA) determines the risks of pesticides and chemicals to human and environmental health, whether the substances are applied traditionally as a spray or expressed by the GM crop . Because GM foods fall under the FDA classification of “generally recognized as safe,” they typically do not require special labeling or premarket approval, that is, they do not have to be approved before entering the market. The FDA recommends that companies go through a voluntary consultation process to determine whether their new GM food would require premarket approval. Approval is necessary if the GM food contains high levels of toxic substances or allergens or reduced levels of important nutrients, but this is rarely the case. Indeed, of the 168 consultations publicly on record from 1995 to 2015, all have resulted in GM foods being exempt from premarket approval . Companies can gain this exemption by demonstrating that the GM food is “substantially equivalent” to a prior existing food in terms of composition, nutrition, and safety . For example, Bt11 corn was engineered to express a protein originally from a species of bacteria that is toxic to the European corn borer, an insect pest. During its consultation with the FDA, Syngenta submitted data that compared Bt11 corn to corn without the additional engineered protein. The amounts of protein, oil, starch, and fiber in the compared plants were not significantly different, so Bt11 corn was not subject to additional testing or labeling regulations. Notably, the potential toxicity of the engineered protein was not evaluated; while the FDA usually requires safety data on potentially toxic substances, insecticides are a special subclass that falls under the jurisdiction of the EPA . The USDA requires companies to submit a wide range of data before GM plants can be introduced in U.S. fields under regulated or nonregulated status. While regulated plants must follow rules ranging from where they can be transported to how much can be planted , Bt11 corn gained nonregulated status after Syngenta showed through field test data that the plant did not act as a weed. Among other results, field tests on Bt11 corn demonstrated that the crop yield was not higher than normal, the gene for the insecticidal protein was stable when passed down to new plant generations, and the insecticidal protein readily degraded after the plants died . As illustrated in Figure 1, the regulation of GM foods in the U.S. is enacted by multiple agencies. Although companies submit different types of data to each agency, common principles unite the various regulatory processes. Regulations are based on the GM foods and how they are used, rather than the genetic engineering technologies that produced them. Additionally, it is relatively easy for companies to receive exemptions from the regulatory processes—particularly, FDA premarket approval and USDA regulations. However, legislation passed by the House of Representatives in July 2015 would change the regulatory landscape if it fully passes into law. The Safe and Accurate Food Labeling Act of 2015 stipulates that instead of undergoing voluntary consultations with the FDA, companies would have to submit all GM foods for premarket approval. Affirming the approach of product over process, the bill would prohibit labeling GM foods solely based on the fact that they were engineered; labeling would only be allowed if the GM foods were different in composition from their conventional counterparts . Figure 1. GM food companies submit the same types of scientific data to U.S. and EU regulatory bodies for approval. Three separate agencies in the U.S. evaluate the potential risks of GM foods, while a centralized approval process is established in the EU. Approval and labeling requirements are stricter in the EU. Compared to the U.S., the EU imposes strict regulations on GM foods. The European Commission, the executive cabinet of the EU, established its general policy for GM food regulation in 2002. In addition to public concern regarding the food safety crises of the 1990s, the EU’s tradition of risk-averse regulation in other areas meant that the precautionary principle became the central tenet for GM food regulation: since potential risks of GM foods are not completely known, regulatory decisions err on the side of caution and require a high burden of proof for product safety [4, 11]. All GM foods are regulated because they are made with processes different from those used to produce conventional foods. 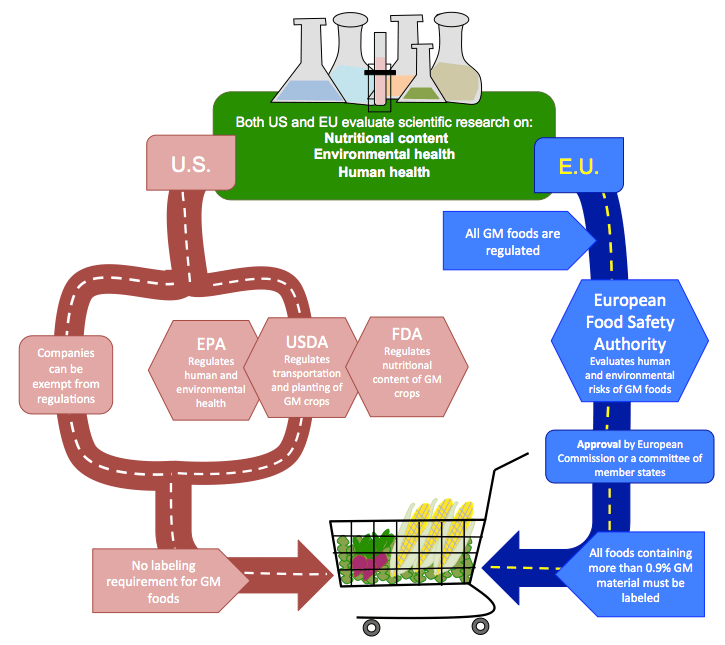 In the EU, all GM food products must go through a centralized process for premarket approval and follow labeling guidelines, summarized in Figure 1. When companies submit applications for GM food approval to an EU member state, the centralized European Food Safety Authority (EFSA) conducts scientific risk assessments. The EFSA is an independent scientific committee that evaluates the human and environmental health risks posed by GM foods, using the same types of data required by the various U.S. regulatory agencies. Returning to the example of Bt11 corn, Syngenta submitted data demonstrating that the plant’s nutritional composition was substantially equivalent to that of corn without the insecticidal protein, the insecticidal protein was not toxic in laboratory mammals, and the chances of the insecticidal gene being transferred out to the environment were low . Approval decisions are drafted by the European Commission based on the EFSA’s evaluations, then voted on by a committee of EU member state representatives. If the member states committee cannot reach a majority decision, then the European Commission makes the final decision for approval. Following approval, GM foods on the market must adhere to labeling guidelines. Specifically, food products containing more than 0.9% GM material must be labeled as being GM foods . Approval of GM foods at the EU level can conflict with the regulatory policies of individual member state governments, with ultimate deciding power recently shifting towards the latter. Before this year, EU countries could ban the use and cultivation of approved GM foods within their borders if additional data not used during the original approval process demonstrated that the foods posed a risk to human or environmental health. The countries had to share the additional data with the European Commission so that a revised approval decision could be made . One example of disagreement between the EU and an individual country is France’s 2008 ban of MON810 corn, Monsanto’s competing version of Bt11 corn that contains the same engineered insecticidal protein. France argued that like Bt11, MON810 was a risk to environmental health because of the potential for resistant insects to develop. In response, the EFSA stood by its original finding that the overall risk to environmental health was low, and that the committee’s guidelines for reducing the potential of resistance were sufficient to mitigate the risk. In 2011, France’s ban of MON810 was declared unlawful by the EU’s highest court, the European Court of Justice . In spite of the legal decision, the French government continued to ban MON810. Because the scientific basis of the ban was not clear, the French government’s actions have been criticized as being politically rather than scientifically driven . The contention between the EU and French governments highlights the fact that member states hold a significant amount of practical power over whether a GM food is allowed. New EU legislation passed in 2015 allows individual countries greater freedom in approving GM foods; specifically, the countries’ approval decisions can be based on factors beyond health risks. Previously, justification for countries’ bans of GM foods was limited to scientific data showing the risk of GM foods to human or environmental health. However, member states can now ban GM foods based on considerations such as socioeconomic policy and cultural traditions of land use . The legislation represents two major shifts in EU regulation of GM foods: more decision power is granted to individual member states, and the influence of scientific data on GM food safety is reduced. Figure 2. Reflecting the fact that U.S. regulations for GM foods are less stringent than those of the EU, more GM crops are approved in the U.S. Furthermore, individual crops are typically approved in the U.S. before the EU. The outcomes of the U.S. and EU regulatory regimes are distinct, with higher rates of GM food approval and use in the U.S. As shown in Figure 2, over the past two decades, the U.S. has approved over one hundred GM crops with a single engineered trait; in contrast, the EU has approved fewer than forty. In general, GM crops are approved in the U.S. before the EU . The difference in regulatory approaches is further reflected in levels of crop cultivation. In 2013, the U.S. cultivated over 70 million hectares of GM crops while EU member states altogether grew less than 0.1 million hectares . Despite the differences in their two regulatory approaches, however, the U.S. and EU evaluate similar types of scientific data and generally reach the same conclusions about the safety of GM foods. Scientific studies represent a systematic method of establishing GM food safety, enabling policy conversations to consider other important aspects of GM food regulations—economics, ethics, and beyond. Figure 3. 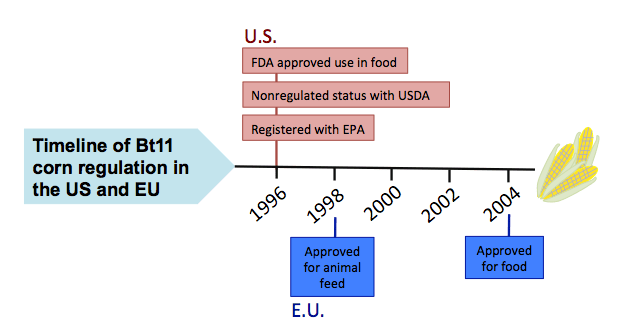 A timeline of Bt11 corn regulation in the U.S. and EU. Jessica Lau is a PhD student in the Department of Immunology and Infectious Diseases at the Harvard T.H. Chan School of Public Health. 1. Sinclair, U. (1906). The Jungle. 4. Bodiguel, L., & Cardwell, M. (2010). The Regulation of Genetically Modified Organisms: Comparative Approaches. Retrieved from Oxford Scholarship Online. 14. Kuntz, M., Davison, J, & Ricroch, A. E. (2013). What the French ban of Bt MON810 maize means for science-based risk assessment. Nature Biotechnology, 31. Thanks for reading! Our policy on figures is here: http://sitn.hms.harvard.edu/press/ But in summary, please feel free to use figures for non-commercial purposes with attribution to Science in the News and the illustrator. Has this been peer reviewed? Hi Alex, our blog posts are not peer reviewed but they’re subjected to extensive internal editing. Also, our authors provide lists of sources and references at the end of each article (or as hyperlinks in the text). Please feel free to peruse those links at your leisure.